Item Number: 810-1458V410 18318 Actual Weight: 11.5 lbs. Organizes commonly used electrical and valve lockout devices for groups of workers. Lightweight carrying case comes with storage compartments for added organization and separate compartments for grouping padlocks, hasps, valve and electrical lockout components. 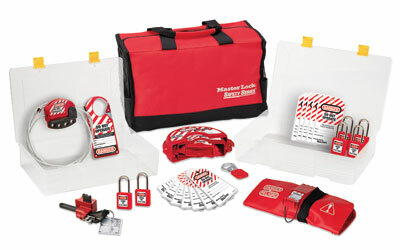 Kits include commonly used components needed for most lockout applications. Padlocks are supplied keyed-different so that no unwanted key interchange occurs.